Ozark Campfire - Youth Program Aids - Beads, Leather, Acrylic, Lucites, and more. 3/4" x 1/2" Yellow Plastic Canoe Shaped bead with a 3MM Hole (Package of 25 beads)..
1/2" x 1/2" 3 layer Lucite coup Green/White/Green with a 3MM hole. 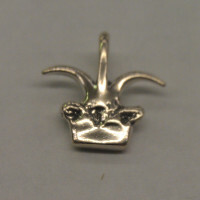 Package of 20 units (10 Pair..
Package of 10, Sterling Silver cast 2gram charms/totems/pendant with a loop. ..